Sidney Slon/Pipe Dream Photographer Sophomore midfielder Kelly Quinn recorded two goals for her second consecutive game as BU fell to Colgate. 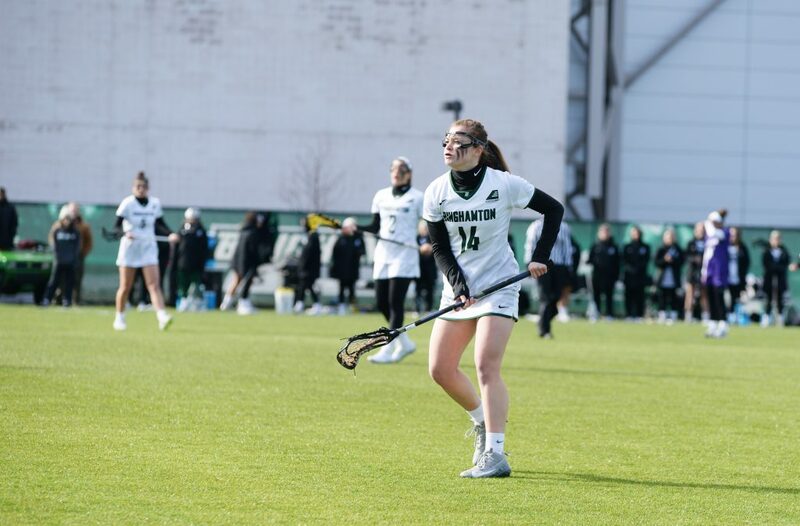 As the Binghamton women’s lacrosse team attempted to close out a match against Colgate with a one-goal lead, Raiders sophomore attack Danielle Van Calcar and senior midfielder Tara Atkinson netted the tying and go-ahead goals back-to-back in the last, demoralizing four minutes for Binghamton. In an eerily similar finish to last Sunday’s game against Niagara, the Bearcats (0-3) broke down defensively and lost critical draw controls, falling for the third time in as many games to start the season. The Raiders (1-1) earned a hard-fought home victory, 7-6. The Raiders struck first, with junior attack Payton Gabriel scoring within 54 seconds of the opening draw, catalyzing a close battle that raged to the final minute in the frigid cold in Hamilton, New York. BU was outshot by Colgate 28-15, and the squad continued to struggle with draw controls, taking just five to Colgate’s nine. Turnovers were an issue for the Bearcats as well; they committed 27 over the course of the game, four more than their opponent. In the previous match against Niagara, the team experienced a similar loss of momentum late in the game, as the Purple Eagles broke a 9-9 deadlock by scoring twice in the final two minutes. Binghamton was frustrated by the final scoreline of the match, especially considering the two-goal lead they held in the first half. However, there were a few positive aspects of the match. Junior goalie Taylor Passuello put together another solid performance, recording eight saves. The team recovered from Colgate’s early goal and shattered the strong control of the game that its foe enjoyed for the first five minutes. Sophomore midfielder Kelly Quinn logged an equalizer in the game’s sixth minute and scored again in the second half, making her Binghamton’s lone two-goal scorer. Quinn, who did not score last season, leads Binghamton in goals with four through the first three games of the year. Sophomore attack Paige Volkmann and senior attack Olivia Batista also recorded solo points in the opening half, keeping the game tight. Sophomore midfielder Alyssa Sanchez and senior midfielder Ciara Gordon netted goals in the second. Despite these flashes of individual skill and the close margin, it is apparent that the team is still in the process of forming a cohesive unit. After graduating 11 players, including three of its top five scorers, the squad is searching for momentum and chemistry. Colgate was able to capitalize on missed pass connections and Passuello struggled to find her teammates and make successful clearances from the defensive end. “You can’t win games with as many turnovers as we had today — that’s something we have been focused on all season and will continue to moving forward,” Allen said. BU will look to use the loss as a learning experience and improve upon its performance as the season progresses. “We’ve had another quick turnaround, so the focus is on moving forward and responding appropriately the next time we step on the field,” Allen said. The Bearcats seek to shake off the defeat and capture their first game of the season at home on Sunday, Feb. 24 against Dartmouth. The game is slated to start at 1 p.m. from the Bearcats Sports Complex in Vestal, New York.